I hope this post finds all of you well especially those on the east coast. We just have a little wind leftover from the storm which is nothing in comparison. Time for a Pottery Barn knock off! 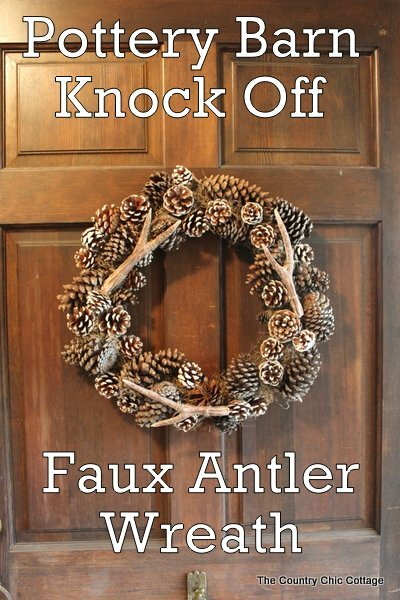 I fell in love with one of their faux antler wreaths. I actually saw it on Pinterest and knew it must be mine. But at $100 that was not going to happen. Time to make my own! Let’s get started on the antlers first. I saw some faux antlers on Pinterest some time ago and wanted to give them a try. I just did not have a place for them until I saw the Pottery Barn wreath. The antlers that inspired me where these from Craftberry Bush. 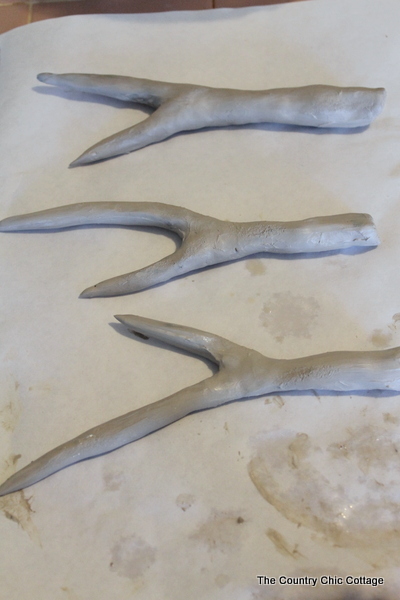 I ended up doing a lot of research on making antlers from clay and I loosely followed the tutorial on Craftberry Bush. 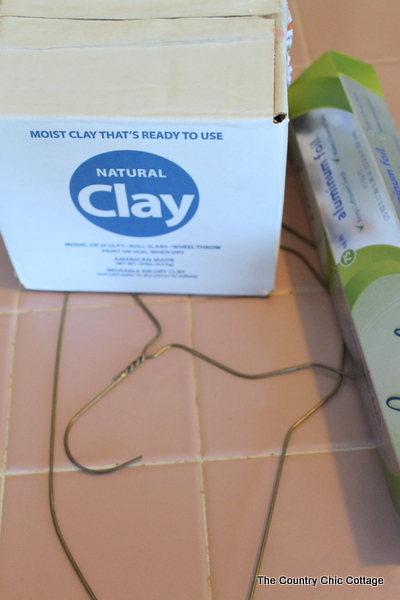 I ended up using metal coat hangers instead of sticks. 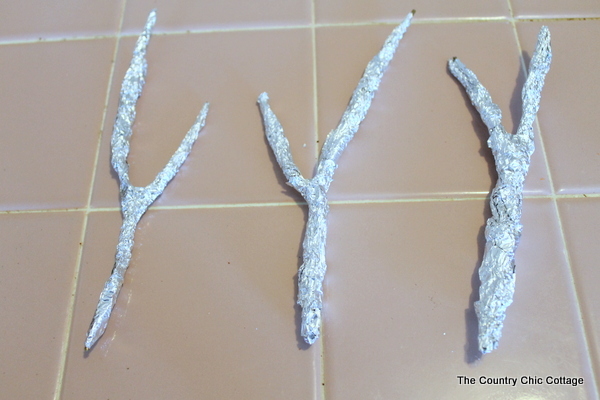 I cut the coat hangers and shaped them into three different “antler like” shapes. I then covered my shapes with aluminum foil making sure the tips are pointed and the end is not. 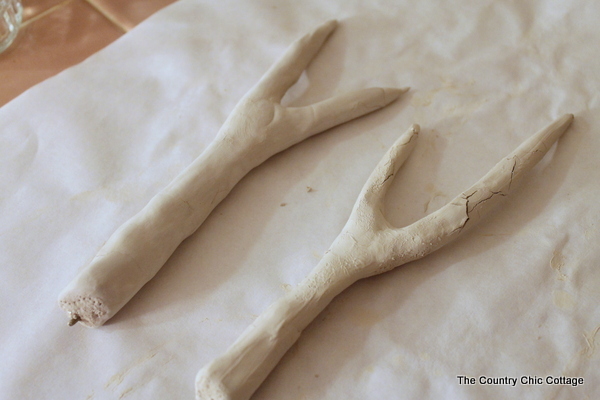 I then covered the shapes in air dry clay until I was happy with the results. Again making the tips pointed and the end not. I took an old paint brush and stippled the ends and a few places along each antler. When all three were done I left them to completely dry for over 24 hours. I really thought I might have a craft fail after this. They cracked y’all. I was upset but forged on. 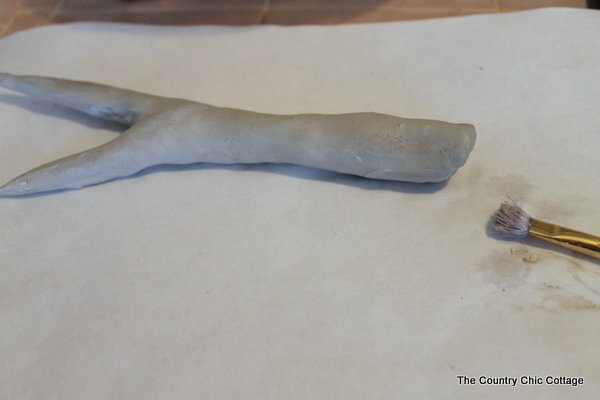 I took a little water on my hands and smoothed each antler out. The one on the left below has been smoothed and the one on the right has not been. It worked! I had to do this twice for each antler letting it dry in between. I did have a few small cracks after that but the paint worked to fill those in. 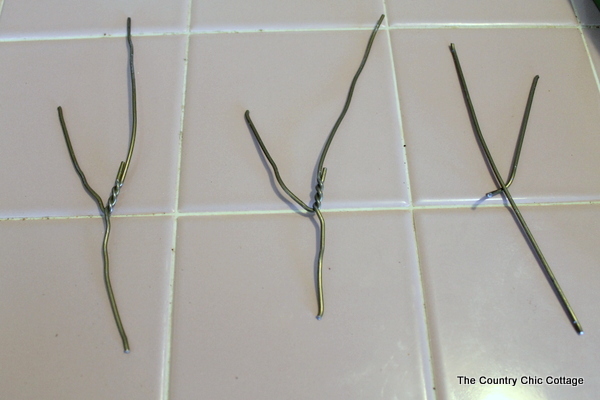 Also notice that my wire came out of the bottom of one. You can just snip that off with some side cutters. Now for paint! I am not an artist y’all. I just pulled up the Pottery Barn picture on my computer, broke out a few shades of white and brown, and experimented. Don’t be afraid. Just break out your brush and get started! The worst that can happen is that you paint over it and start over. I played around until I was happy with the results. Are they perfect? Nope. But they are pretty! Now for the wreath. I made mine inside of a box cause this gets messy! 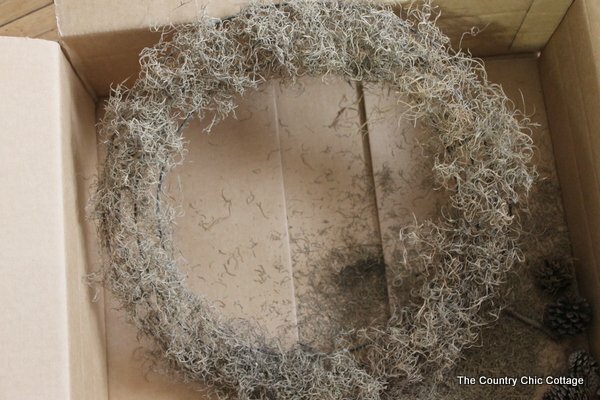 Cover the form loosely with spanish moss and LOTS of hot glue. You can see that not all areas got covered but that is okay. 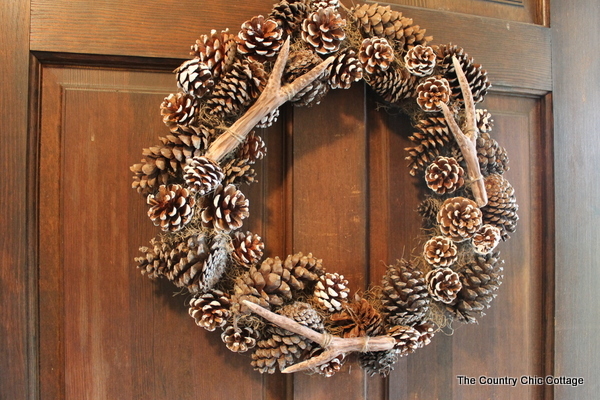 I then took a few plain pine cones from the yard and used hot glue to adhere them to the form randomly. 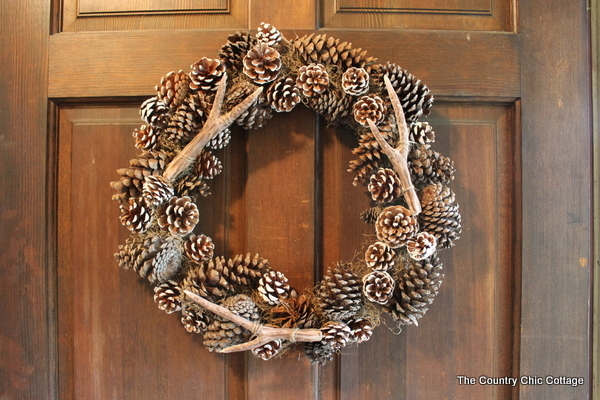 I then took my white tipped pine cones and filled in around the wreath until I was happy with the result. Again adhering with hot glue. 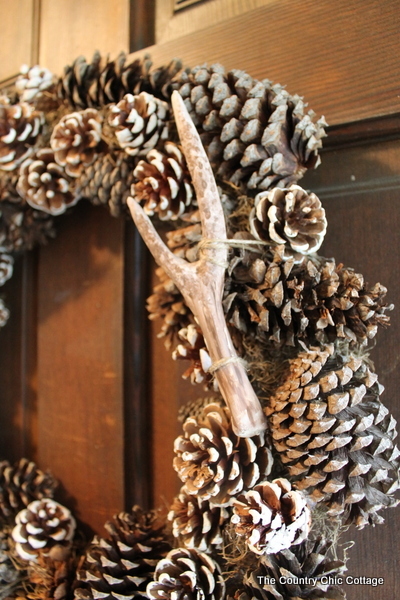 Then take your painted and dry antlers and just tie them onto the wreath with twine. 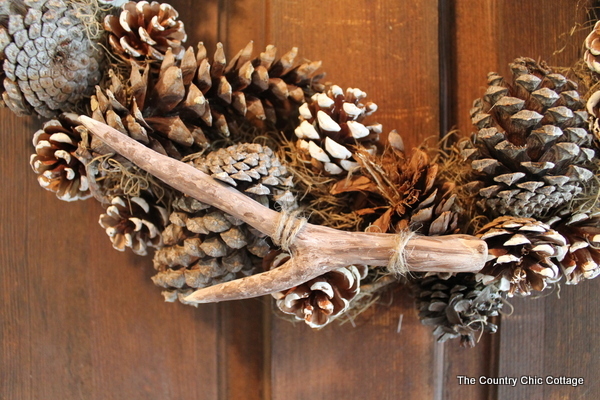 This one is ready to hang on your door to invite in all of your fall guests! This one would also be awesome with a red bow for Christmas. Seriously this may be my favorite wreath ever! A word of caution — your antlers are NOT made to get wet. I have mine on a door that is protected by a glass storm door. Please do not hang outside or your antlers may melt away. I hope y’all have enjoyed this wreath as much as I have and will make your own! This one would be good for fall, Christmas, winter, really any season! Amazing job! I love this and may have to try it out myself! This is truly amazing and impressive! You should sell them!! Wow, It looks identical to the pottery barn one! I would LOVE for you to link this up at my Ginger Jamboree Link Party!! AMAZING!!! Pinning. Stumbling and Tweeting. You rocked this, Angie!! Oh my!!! Girl that is super gorgeous! I may have to try that. I am going to pin it for sure! Thank you for the great tutorial. I cannot believe you MADE those antlers!!! Totally awesome!!! Thank you! 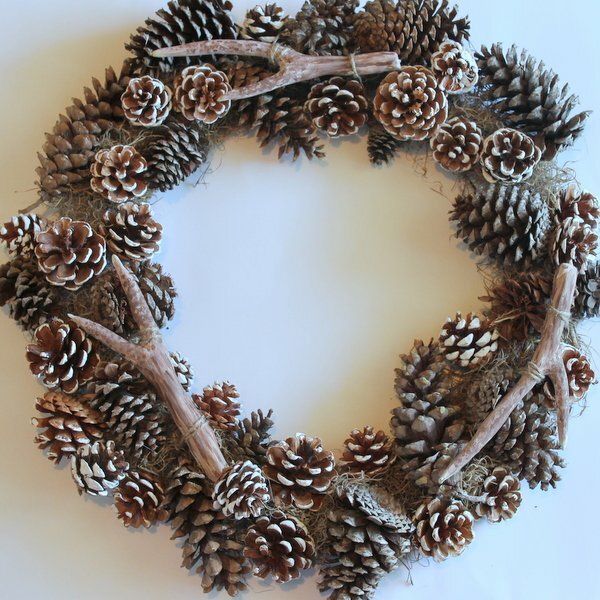 I had actually ordered this wreath, and pottery barn just informed me today that they are permanently out of stock. This sounds like more fun anyways, I think I will try it! Wow your wreath looks exactly like the PB one! Great job! Wow, that is a good knock-off. Pottery Barn ‘d better watch out! Hey Angie! I’ll be featuring this on Copycat Crafts on the 29th. Love it! 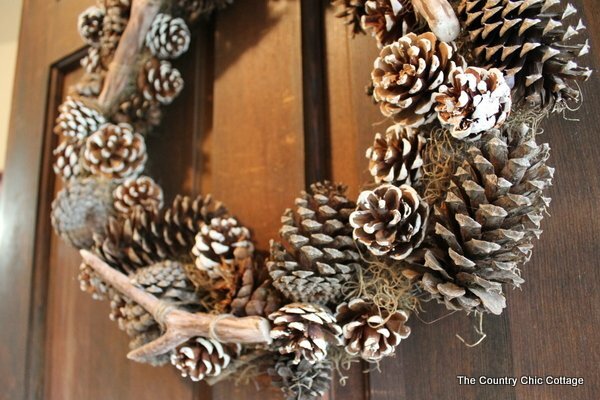 This wreath is fabulous! 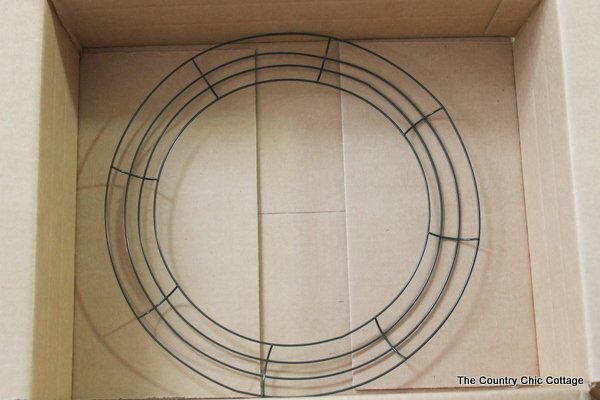 It looks so much better than the Pottery Barn wreath! You are so creative. I love how you kept the mess down by using a box! Your antlers are the best! 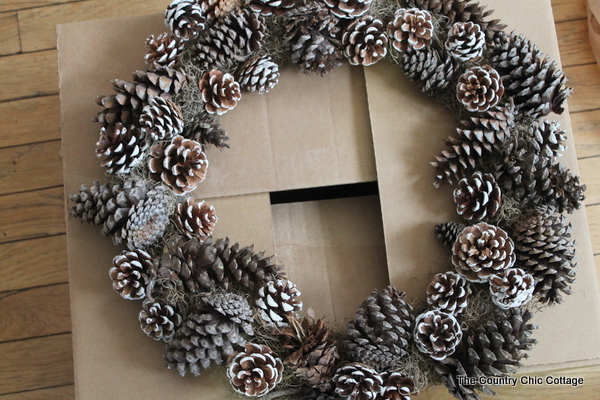 You should be very proud of this wreath! Now it’s my turn to give it a try. ! Love it’s! 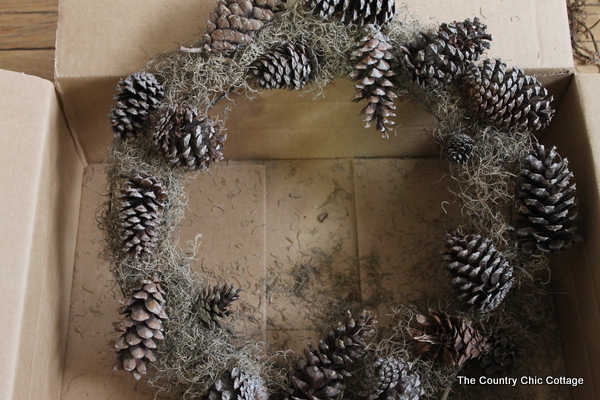 I have some pine cone wreaths from restoration hardware that would be great for this project. Just tie on some antlers!